home / Multimedia / The Holy Land in news / New volunteers at Association pro Terra Sancta meet the Custos: ..
On Friday 2 October, the new volunteers of the Association pro Terra Sancta, met for the first time with father Pierbattista Pizzaballa, Custos of the Holy Land and president of the Association. The volunteers told him about themselves and about the job they are here for. 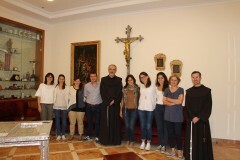 There are six new volunteers: most of them have been in the Holy Land for a very short time and someone arrived just the day before the meeting. They are here for a job shadowing work to support the various activities of the Association pro Terra Sancta in Jerusalem and Bethlehem. 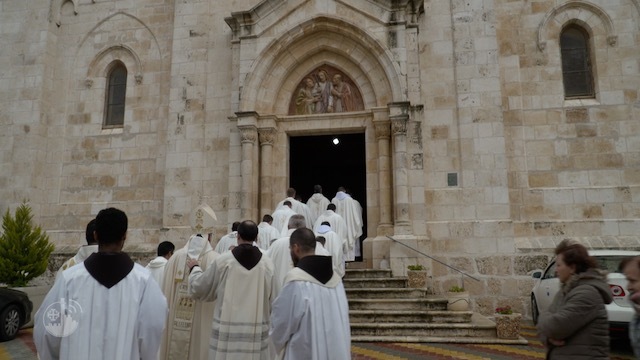 Among them there are those who will be responsible for communication, project reporting and translations, someone will help with the fundraising and others will be more directly involved in projects; for example, two of them will teach Italian language to the Franciscan novices and to local young people. After a short introductory round during which everyone told something about himself, the Custos of the Holy Land presented the local reality.The area in which the Custody of the Holy land is present is really vast and includes, besides Israel and Palestinian Territories, also Egypt, Lebanon, Jordan, Syria, Rhodes and Cyprus. “What struck me about fr. Pizzaballa” said one of them, “is that, although he has many responsibilities, he was so calm and available with us”. Another volunteer approved: “A really affable and simple person”, he said. A warm welcome to our new volunteers!